You will remember that in April of this year I made a pilgrimage/retreat with my priest friends to the town of Ars in France, the home of St. John Vianney, the patron saint of all parish priests. He did all that and more over the course of the next forty-one years as their curé, or pastor. By the time of his death in 1859, it is estimated that more than 100,000 pilgrims were coming to the town of Ars annually to attend Mass or go to confession to the man they knew to be a living saint. On May 1, 1836, the Curé of Ars did something very beautiful, and very valuable for his people: he consecrated the entire parish and all parishioners to the Blessed Virgin. 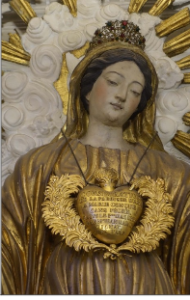 He had a votive heart made to hang around the neck of the statue of the Blessed Mother in the Church. Then he took a long ribbon and, with his own hand, inscribed the names of all of his parishioners on it, and then placed it inside the votive heart. On it he had engraved these words: “Consecration of the Parish of Ars to Mary Conceived Without Sin, Made the First of May, 1836, by M. John Marie Vianney, Curé of Ars.” This was his way of making sure that his parish and his people were always under the patronage and protection of the Blessed Virgin Mary, and always kept in her maternal heart. During my pilgrimage to Ars, while praying before the statue of the Blessed Mother in the church, with that heart hanging around her neck containing the names placed there by the saint 182 years ago, I realized that I had to do the same thing here in our parish. Below you will see an image of the votive heart I have obtained for our parish. Made of silver, it was handcrafted in France around the year 1880. The front is engraved with the letter “M” surmounted with a cross, indicating Mary standing at the foot of the Cross of her Son, and united with Him in His work of redemption. This is also the symbol on the obverse of the Miraculous Medal, as seen in the vision of St. Catharine Labouré in 1830. Around the edge, it is engraved with lilies, a symbol of the Blessed Mother. Finally, the heart is surmounted by a flame, always seen in depictions of the Immaculate Heart, and representing Mary’s burning love for God and for all of us as her spiritual children. Inside, there is a compartment where the names will be placed. This week I encourage all parishioners to fill out a card with the names of your family’s living parishioners (we will collect the names of deceased parishioners for the heart at a later date). Then, thanks to computer technology, all of the names can be printed in small enough type to fit on a paper to go inside the heart. 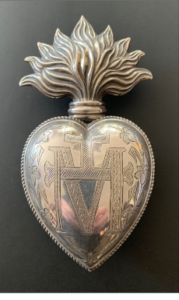 On December 8, 2018, we will consecrate our parish to the Immaculate Heart of Mary, and bless the votive heart and all the names contained within and place it around the neck of the statue of the Blessed Mother in our Church. In this way, you the people of St. Mary’s will always know that you are under Our Lady’s protection, and occupy a special place in her heart. This week we celebrate the Solemnity of the Nativity of the Lord on Friday, and the Feast of the Holy Family on Sunday. These two great feasts always follow each other to remind us that our Savior was born not only in a real time and in a real place, but also into a real family. When I was assigned by Bishop Murphy to St. Mary’s in February of 2013, despite growing up nearby, I had never been to the church. When I entered it for the first time, I was both amazed and joyful. Amazed, that such a beautiful church had survived in its original configuration from the 1870’s, and joyful, in that God was giving me the opportunity to serve both Him and you here. On that first visit, I distinctly recall looking up into the dome of the sanctuary and seeing the beautiful image of the Madonna and Child. 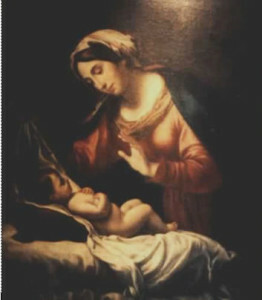 It is, primarily, a Christmas image; the Blessed Mother attending to the infant Jesus and His swaddling clothes. And it is also very much a tender family image; a beautiful depiction of domestic life and maternal love. And, what’s more, I knew I had seen it before. Shortly after my arrival, I took the photo at right, and sent it to my priest friends for identification. No one thought they had ever seen it before. I was incredulous. I responded that not only had they seen it, they had even received Christmas cards with similar images. But they all disagreed. I then began the search which, even with the internet, was much harder than you might think. Without the name of the artist or even the title of the painting, it was a daunting task. But eventually persistence paid off. Carlo Dolci was an Italian renaissance painter who was born in Florence in 1616, and died in the same city in 1686. He painted mainly sacred subjects in his career, often small scale works, and was notoriously slow at completing projects. This may be why many of his paintings are better known as copies by other hands, rather than by the original work. A case in point is our image, titled The Madonna of the Veil. Reproduced countless times over the centuries, it is an enduring and popular image of a tender moment between the Blessed Mother and her Divine, newborn Son. The original, in the image lower right, was stolen from a private collection some years ago and so is currently lost to us. I think I actually prefer our copy by an unknown artist to the original. The painting captures the Blessed Mother in a moment of “unveiling” her Son. There is a spiritual truth depicted here beyond merely a mother attending to her baby. Mary of Nazareth, by agreeing to become the Mother of God, truly did unveil Jesus before our eyes. Just as the veil in the temple would be torn in two at His death, so at His birth the veil between heaven and earth was lowered by the simple, humble, peasant girl of Nazareth. And, because of her faith and trust in the Lord, for all of us God now forever has a face, and a human face at that. 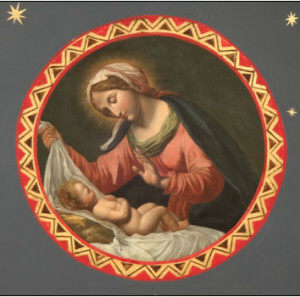 This Christmastide, and every time we come to Mass and look up at this beautiful image, let us give thanks to our patroness for unveiling her Son to us, as we give thanks to the Christ Child for coming to save us.